INTENSE™ Gift Certificates are an excellent way to share the gift of high performance with others. We even give you an incentive to share by adding an extra 5% credit to each one. You can choose to have them sent electronically or via mail. Please enter the amount of your INTENSE Gift Certificate into the "Quantity" box with no alphanumeric characters, spaces, or periods (E.G. $200 value is "200"). 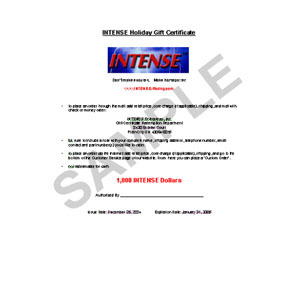 INTENSE™ Gift Certificates are redeemable in U.S. Dollars (USD) for purchases and labor. Your extra 5% bonus will be added automatically when your gift certificate is sent. There are currently no customer product reviews for the product. Be the first to write an online review and share your thoughts with others.